They make it look easy on TV, fishing in a private reservoir stocked with 300 million Bass. Anyone can catch fish that way. What do you do if you are just a regular Joe fishing on a lake that gets a lot of fishing pressure or the fish are not active. Bass like to hide in the thick weeds and grasses that you find along the shore. The bass have a high tolerance to warm water with low oxygen which give them the ability to come closer to shore then other fish and take advantage of the food that's available such as bigger insects, frogs, mice, snakes or even baby birds. If the bass are really feeding heavily, they will come out of the grass, wild rice or cattails to the weed line to hunt down minnows. In this case you can just throw spinner baits and drag them along the weed bed. This is a relaxing type of fishing because you do not have the aggravation of taking weeds off your line every cast. 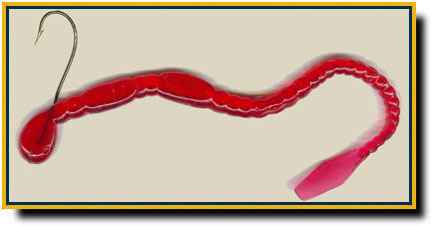 A spinner bait, tinsel tail spinner or even a surface lure like a Spook or a Hula Popper will work great. Generally the better colors are white, black or worm color. When the Largemouth Bass slow down. When the bass start to slow down, which is usually from too much sun or heat, they tend to go back into the grass or underneath floating islands of cattails. They can also go deep. First, I will talk about bass taking cover in shallow water and show a weed-less Texas Rig and Carolina Rig. The only difference between the two rigs is a Carolina Rig has the slip sinker up the line about 12 inches. Texas Rigs should be used where there are lots of logs and snags while the Caroline Rig should be used in the weeds or Lily Pads. There is also a difference in the motion. A Texas Rig gives more of a vertical jigging motion while with the Carolina Rig, the rubber has more of a dart motion as it follows the sinker. Step 1) Get yourself a slip sinker, a bass hook with a medium to long shank and a bass rubber. I have used a red rubber because it looks neat on the Internet but I have actually never caught a bass using these red rubbers. I like to use White, Black or worm color. Step 2) Stick your hook into the rubber. Step 3) Pull the hook right through so the eye of the hook (where you tied the line on) is hidden inside the rubber. Step 4) Twist the hook around 180 degrees and then shove the hook back into the rubber. Just put the hook in deep enough that you have broken the surface on the other site but do not have the hook sticking out. The whole idea it to keep the rig weed-less or snag-less. Step 5) For a Texas Rig, leave the sinker to slid down right to the hook. Step 6) For a Carolina Rig, slide the slip sinker up the link about 6 to 12 inches and then place a little split shot on the line to hold the sinker in place. In some lakes, the bass will go deep and hide down in the deep weeds. I have seen some really big Largemouth Bass being caught by people who where Walleye fishing. If you are not getting them along the shore, try pulling a Texas Rig through the thick weeds or drift over a deep weed bed with a spinner and a long dangling worm. Some times you just have to use live bait. As a kid, I always hunted Largemouth Bass along the shore with a hook, float and a bucket of minnows. Worms, small frogs and crayfish work good but I think Chub, Sucker or Shinner minnows are the best. Get a medium size hook and a small float. Have the float about 6 to 12 inches up the line (depending how deep it is) and hook your minnow on. Hook the minnow in the mouth. Don't hook the minnow in the back because they die twice as fast. Just paddle or use your electric motor and move along the shore. Cast your minnow at the edge of the grass or lily pads and just wait. The very best spot is under a big log or under a floating mass of cattails (bullrushes). When you get a big mass of cattails coming out from the shore, the edges are usually floating because the wave actions keeps the roots of the cattails from planting in the bottom. Some of the biggest bass I have ever caught were hiding under these cattails. Cast your minnow to the edge and wait. A bass might look at a minnow for 5 minutes before taking it. If you think nothing is going to happen, then slowly bring the minnow back to you. Sometimes the bass hit when the minnow starts moving away. There is one rule that's always true. The slower your float goes under and the slower the bass swims away with your minnow, the bigger he is. So if you see your minnow racing around, then it's probably a perch, crappy or a rock bass. Pro Bass Fisherman use heavy 15 to 25 pound test because they are speed fishing. They are not there to enjoy the day or the fight of the fish. They want to bring the fish in as fast as possible so they can win money. If you are fishing bass for enjoyment, then use 6 or 8 pound test line. You will get more hits, you can cast farther and it's ten times more fun bringing the fish in. With 15 to 25 pound test line, you might as well be bringing in an old shoe.